You’ve stared at the poster in the bathroom at Woodcraft and spent hours wondering how one man could create such an amazing piece of functional art. Now experience the Studley Toolchest like never before. Get the book. See the Toolchest in person. Try to get your nose so close to it that Don Williams gives you a patient-yet-stern look that obviously means “back off”. Then smile sweetly and hand him the book to autograph. Then you can look at the Studley Toolchest in your own bathroom! 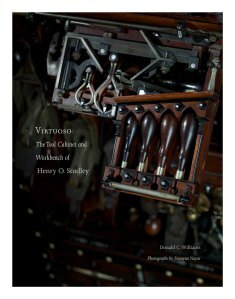 You can now order “Virtuoso: The Tool Cabinet and Workbench of Henry O. Studley” by Don Williams from the Lost Art Press store. The book is $49 and will ship in mid-May. Orders received before May 13, 2015, will receive free domestic shipping. The first 1,000 orders will receive a nice commemorative postcard featuring a beautiful shot of the open tool cabinet shot by Narayan Nayar. When you order, you will have the option to pick up your copy at Handworks in Amana, Iowa., on May 15-16, or have the book shipped to you. All shipping will occur after Handworks. While we are certain that many of our retailers will stock “Virtuoso,” we do not know which ones yet will opt to carry it. When we have that information in the next couple weeks, I will definitely post it here.